In this uptempo swing, Gigi Gryce borrows changes from I'll Remember April and transforms them into an entirely new composition. Lead sheets and second parts available, plus transcriptions of Gryce's alto sax solo and Joe Gordon's trumpet solo. We also have a "Gigi Gryce Project" version available with Minus You audio tracks for all instruments as well as a full quintet track. Ben Henriques, tenor sax; David Blake, guitar; Wynston Minckler, bass. 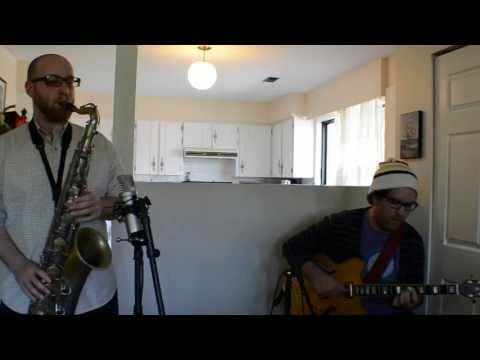 A classic Gigi Gryce head based on I'll Remember April changes. In addition to the melody lead sheets, separate second parts are available so you can play it with a quintet. Note that the lead sheets for the Blakey version and the Gryce Project version are not identical. The Minus You Gryce Project lead sheets work as stand-alone lead sheets but are also tailored to the Minus You audio tracks. Don Sickler: "The lead sheet represented here is from Gigi Gryce's second recording of this composition. Gigi first recorded it with Clifford Brown the previous year (October 8, 1953) in Paris for the Vogue label. For that recording, the composition was titled Salute To The Band Box. Gigi and Clifford Brown were in Europe that year with the Lionel Hamption big band. Although the ‘Band Box’ was, in fact, a late 1920s Harlem jazz club, I'm sure the composition title referred to the ‘Bandbox,’ a short-lived basement venue which opened in the summer of 1953 in midtown NYC, and where the Lionel Hampton band had a gig before leaving for Europe. Maybe the title of the composition was changed because Gigi and many of the other young jazz greats in the Hampton band had a big falling out with Hamp, or maybe it was because this second recording was under the leadership of Art Blakey, who was a Birdland rhythm section fixture. Regardless, the ’salute‘ changed clubs, from the Bandbox to Birdland for the present recording. This same composition also has a third title, Reunion, used when it was recorded by Benny Golson on ‘The Modern Touch’ album for Riverside." Two more great Gryce titles from the "Blakey" recording are also available: Hello and Minority. Transcribed Alto Sax and Trumpet Solos: This Gigi Gryce classic is worthy of special attention, as are the soloists. Gigi Gryce and Joe Gordon have different approaches to this great composition: compare how the two different soloists, first Gigi, alto then Joe, trumpet navigate the changes. There are concert editions of both solos; a B-flat edition is also available for Gigi's alto sax solo, so trumpet players, for example, can also get inside the mind of the saxophonist. As with Minority, our "Gigi Gryce Project" version of Salute To Birdland is quite fast and a worthwhile challenge for Minus You. This one is straightforward with no intro or coda; on the bridge, the alto sax has the melody for the first eight measures with the tenor taking over for the second eight. Unlike most of our Minus You songs, this arrangement does not have separate piano, bass, and drum parts. Instead, we have a single Rhythm Section part which has all the information necessary for each rhythm section instrument to play along with their respective Minus You track. Though the piano and drums have some hits with the melody, the bass walks throughout except the last measure of the bridge. I was determined to have saxophonist Ralph Moore on "The Gigi Gryce Project" recording, even though he had already left the New York area for the West Coast and his Tonight Show job. I suggested he record this composition partly because I remembered having a great time when I got a chance to record it with Ralph myself in 1986. I (on trumpet) and Ralph had the honor to play on guitarist Jimmy Gourley's session. Jimmy was also on Gigi's original recording (with Clifford Brown), where the composition was called Salute To The Band Box, as it was on Gourley's 1986 session. The session, recorded by Rudy Van Gelder, was memorable in many ways, and it was the first time that either Ralph or I got to record with drummer Victor Lewis. A perfect chance to get your fast chops together! If you're a rhythm section player, in addition to locking in with the rest of this great rhythm section, you have two great horn soloists to comp for! Minus You audio These are tracks from the quintet recording. The rhythm section editions are simply explained: minus either piano, bass or drums. The minus melody practice edition has additional solo space, because the original track had a piano solo; the piano solo has been eliminated, giving the melody instrument a chance to solo with just bass and drums. Rhythm section players: get the rhythm section part. The following shows a breakdown of each track edition. There are five Minus You MP3s, with different combinations of instruments. trio performance 2 solo choruses These tracks have the same format as the minus melody performance editions. Note from trumpet player Don Sickler: When I was a young trumpet player growing up in Spokane, Washington, I would have given anything to have minus you tracks to play with. Keeping that in mind, now that I'm able to create those editions, for the melody/soloist I feel it's sometimes helpful to have two different editions. Since our Minus You editions often come from recordings that originally had several different soloists, having a track with all or most of this solo space can be very helpful in giving you lots of room to experiment (our practice edition). But, for example, to use it as an audition tape, the track would need to be shorter. Therefore, we have sometimes created a "performance" edition as well, with fewer solo choruses.